Tenable, a leading cybersecurity company that provides a new category of security software called Cyber Exposure, which they call “a discipline for managing and measuring cybersecurity risk in the digital era”, filed for a $100M IPO. The company plans to trade on the NASDAQ under the symbol “TENB” and Morgan Stanley is leading the offering. Tenable is the 13th SaaS/cloud IPO this year and 3rd cybersecurity company to file in 2018 in the U.S. behind Zscaler and Carbon Black. Tenable’s vision is to “empower every organization to understand and reduce their cybersecurity risk”. Their solution is designed to provide visibility and insights into cyber exposure across any surface vector within an enterprise, whether on premise or in the cloud. With digital transformation, cloud adoption, and IoT taking hold within enterprises, the surface area for cyber attacks has dramatically increased exacerbating the need for Tenable’s solutions. The company’s platform is designed to be the system of record for an organization’s CISO (Chief Information Security Officer) offering a single pane of glass view into a company’s cybersecurity posture. As of 2017, Tenable had over 24,000 customers located across 160 countries. The company was founded in 2002 and has 1,054 full-time employees. Tenable is based in Columbia, Maryland. As of December 31, 2016, and 2017, Tenable had over 21,000 and 24,000 customers, respectively, who licensed Tenable.io, SecurityCenter or Nessus Professional products. This includes over 3,100 and 4,400 enterprise platform customers at those respective dates, which are defined as a customer that has a current license for Tenable.io or SecurityCenter and pays $5K+ annually. 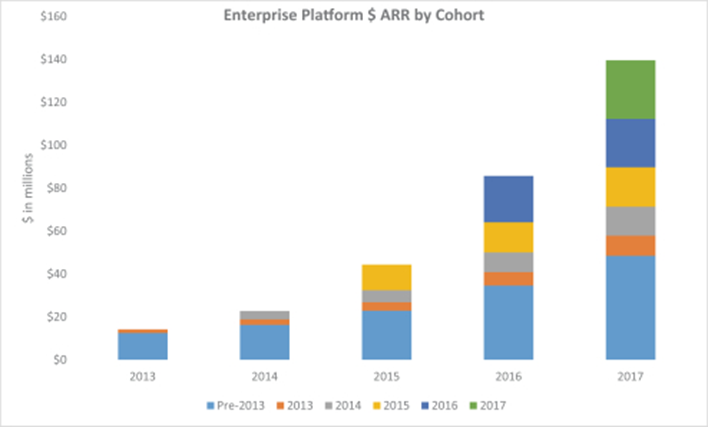 Revenue from their enterprise platform offerings ($5K+ deals) accounted for 58%, 67%, 64% and 72% of total revenue in 2016, 2017 and Q1'17 and Q1'18, respectively. Their overall average ACV or annual contract value (total recurring revenue over total customers) was ~$7,800 in 2017. For enterprise customers the average ACV was ~$28,000. Tenable’s dollar-based net expansion rate was 124% in Q1'18. As of December 31, 2017, 53% of the Fortune 500 and 29% of the Global 2000 organizations licensed paid versions of Tenable’s various products, including enterprise platform customers in 30 of the Fortune 500 and 58 of the Global 2000 organizations. In 2017, billings to large enterprises, mid-size enterprises, and small enterprises were 55%, 21% and 24% respectively. Tenable defines large enterprises as customers with greater than 2,500 employees, mid-size enterprises as customers with 250 to 2,500 employees, and small enterprises as customers with fewer than 250 employees. Recurring revenue, which includes software subscriptions and recurring maintenance from perpetual licenses, represented 86% of total revenue in 2016 and 2017. Customers located in the United States accounted for 69%, 69%, 71% and 67% of total revenue in 2016, 2017 and in Q1'17 and Q1'18, respectively. The average sales cycle for an enterprise customer is approximately 4 months. No customer accounted for more than 2% of revenue in 2016, 2017, Q1'17 or Q1'18. Tenable’s Nessus product has been downloaded ~2M times cumulatively from 2004–2017. As of March 31, 2018, the company had 14 issued patents and three patent applications pending in the United States. With approximately 750,000 security professionals in the United States according to CyberSeek, Tenable believes that the substantial majority of security professionals currently use or have used Nessus (Tenable’s widely used self-serve vulnerability assessment tool) at some point in their career. Tenable has an inside and field sales team but the vast majority of their sales are done through channel partners in a two-tiered fashion — Tenable sells enterprise platform offerings to distributors, which in turn sell to resellers, which then sell to end users, which are Tenable customers. In 2016, 2017, Q1'17, and Q1'18, Tenable derived 80%, 83%, 80% and 86% of revenue respectively from subscriptions and perpetual licenses sold through channel partners. The company has significant concentration with Ingram Micro, which is responsible for almost half of Tenable’s sales and accounted for 42%, 45%, 41%, and 45% of revenue in 2016, 2017, Q1'17, and Q1'18, respectively. Enterprise contracts are generally priced based on the number of IP addresses that can be monitored or on the total IT assets that can be monitored. Nessus, their self-serve offering, is generally priced on a per-license basis. Both offerings can be deployed on premise or in the cloud and 75% of revenue in Q1'18 was from subscriptions. Given the widespread recognition and ~2M cumulative downloads of Nessus, many enterprise customers start with Nessus on a free or paid trial, and Nessus Professional (the paid version) accounted for 26% of total revenue in Q1'18. Tenable has 19,000 Nessus Professional Customers and their website pricing starts at $2,190 for an annual subscription. Tenable.io: Primary SaaS offering that can secure both traditional and modern IT assets, cloud environments, containers, and IoT. In late 2018 Tenable plans to release Tenable.io Lumin, a prioritization and benchmarking product. SecurityCenter: Manages cybersecurity risk across traditional IT assets and can be run on premise or in the cloud. Industrial Security: Launched in 2017 in partnership with Siemens, the product is an Industrial Security (OT) product that offers asset discovery and vulnerability assessment across critical infrastructure in energy, utilities, and other sectors. Industrial Security is a standalone solution. 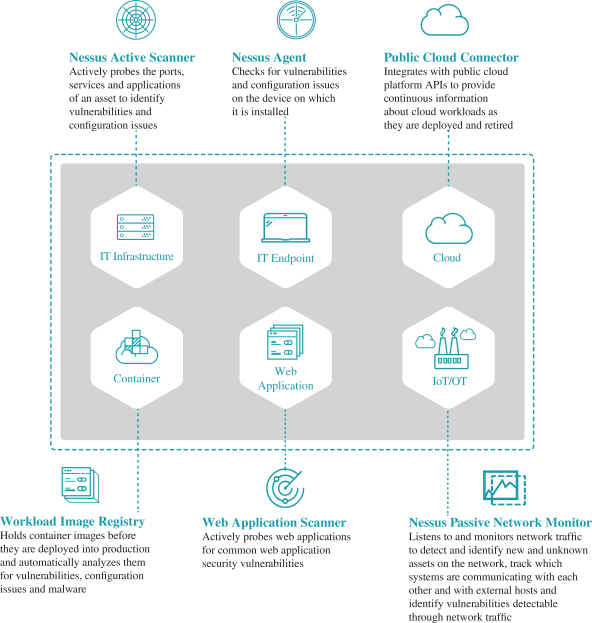 Tenable also has their Nessus offerings, which are community products which can serve as on-ramps for their enterprise solutions. Nessus Professional is a vulnerability assessment solution for identifying security vulnerabilities, configuration issues and malware, mostly for consultants and those with ad-hoc needs. Nessus Home is a free product that works on a limited number of assets. Tenable believes they play in the traditional vulnerability management market, which IDC pegs at $3.7B in 2017, growing to $5.8B by 2021, a CAGR of 12%. Because Tenable addresses a wider range of attack surfaces, such as cloud workloads, a broad range of web applications, containers, IoT, and OT, they believe their total TAM will be ~$16B by 2019. The company gets to that number by applying their estimates against the total number of assets of cloud workloads, container instances, connected IoT devices, servers, PCs, business smartphones, and personal computers. The cybersecurity software market is highly competitive, and Tenable’s vulnerability management and assessment market is no different. The company believes they compete with Qualys and Rapid7 in the vulnerability / assessment market, IBM given their diversified security suite, endpoint vendors with vulnerability capabilities like Tanium and Crowdstrike, and other point solutions and open source products. The company also competes with AlienVault, a venture-backed company that offers a unified security platform with a popular open source product. According to Pitchbook, the company has raised $300M to date from investors including Accel, Insight, In-Q-Tel, and Glynn Capital. Although, unlike almost all venture-backed IPOs, Tenable has never raised any primary institutional capital. 5%+ pre-offering VC shareholders include Insight (35.3%) and Accel (34.4%). Amit Y. Yoran, President, CEO, and Chairman is at a 3.3% pre-offering stake. The company did a $250M secondary transaction led by Insight and Accel at a $300M pre-money valuation in November of 2015, according to Pitchbook. Tenable has grown very efficiently, has high gross margins in the mid-to-high 80’s, and is seeing leverage with the increased investments in growth. Rarely do companies spend more to grow faster yet improve their margins. 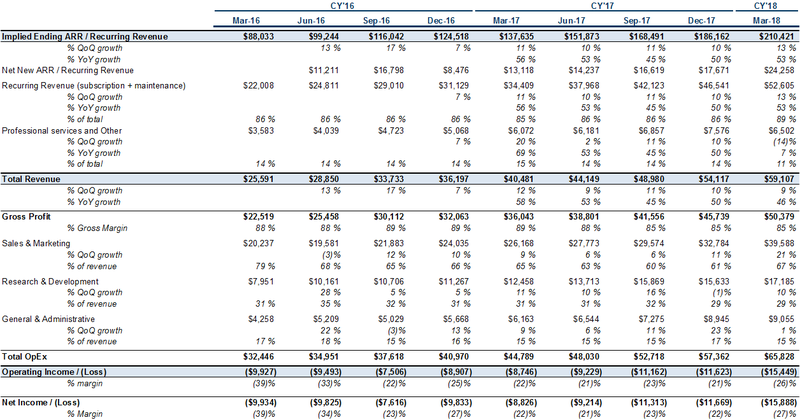 For example, they grew revenue 33% YoY in CY 2016 and had a (28)% non-GAAP profit margin, and in Q1'18 grew revenue 46% YoY and had a (23)% non-GAAP profit margin. 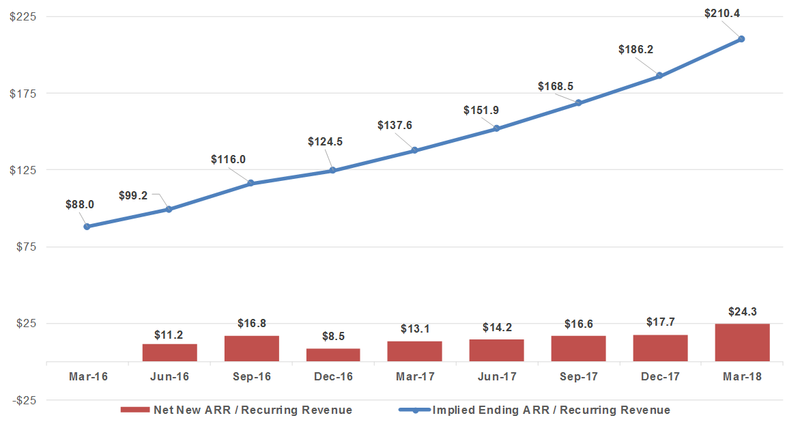 Moreover, in the past 9 quarters the company has increased recurring revenue by 2.4x while growing sales and marketing by <2x. 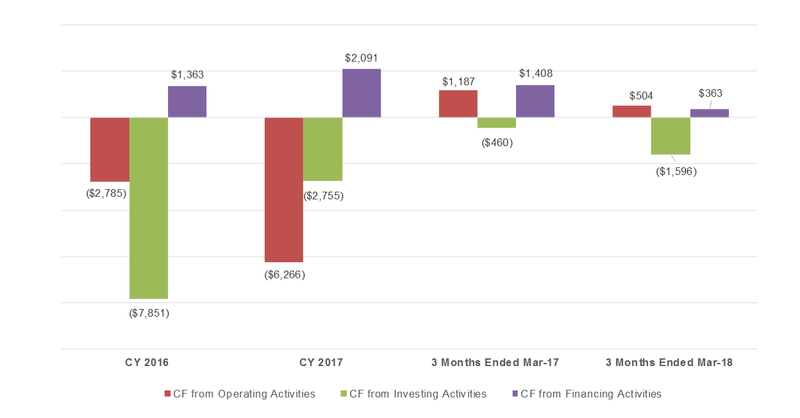 Unfortunately, they don’t disclose customers by quarter so I can’t derive what CAC looks like, but their implied median months to payback using a CAC ratio (implied net new ARR or recurring revenue * gross margin / sales and marketing spend of prior quarter) was 24 months over the past 8 quarters. Tenable does not disclose any churn data but given their dollar-based net expansion of 124% last quarter, churn doesn’t seem to be a problem for the company. The company has $26.7M of cash on the balance sheet and while they have a revolving credit facility, they have yet to draw any money down. Outputs of other financials and metrics are below. 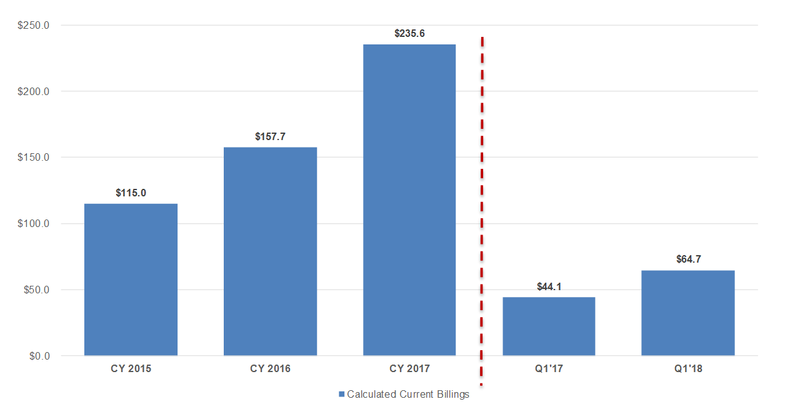 While most of Tenable’s revenue is recurring from software subscriptions, some of their recurring revenue is from maintenance contracts. 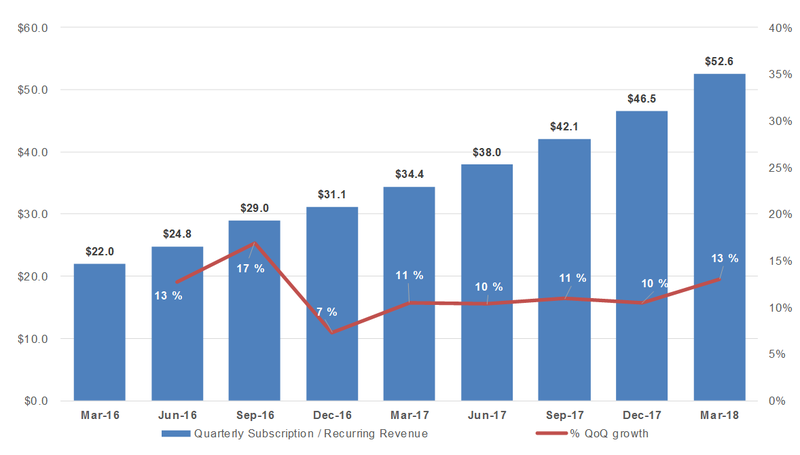 In the most recent quarter (Q1'18) Tenable ended at $210.4M of ARR and added $72.8M of implied net new ARR over the past 12 months and almost $25M last quarter (other SaaS IPO ARR ramps here). 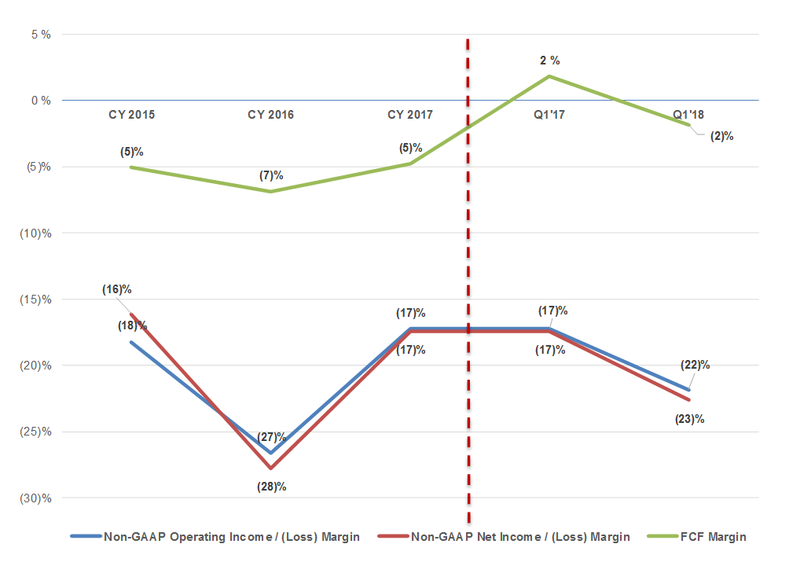 Tenable has held non-GAAP operating and profit margins close to (20)% — while almost breakeven on free cash flow margins while increasing revenue growth 37% in CY 2016 to 47% in Q1'18. 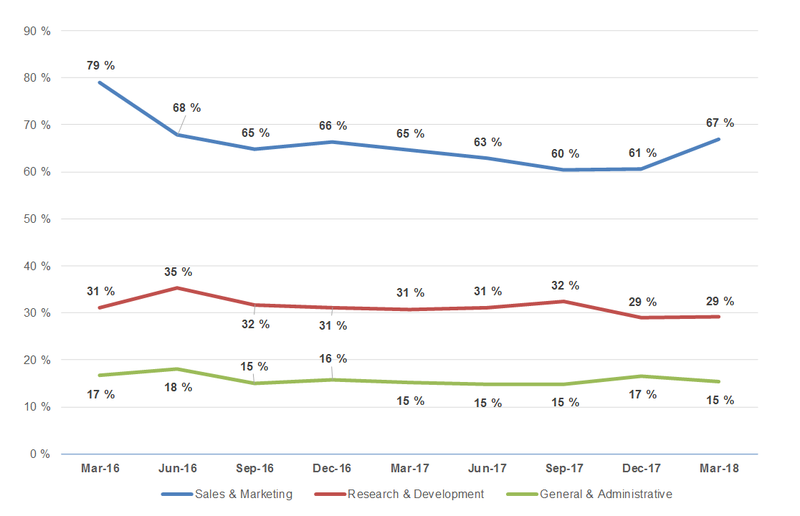 While Tenable does not disclose much detail around their cohorts with regard to actual numbers (see chart below), it’s clear enterprise customer ARR stacks nicely over time and the company has strong dollar-based net expansion — 124% in the most recent reported quarter. 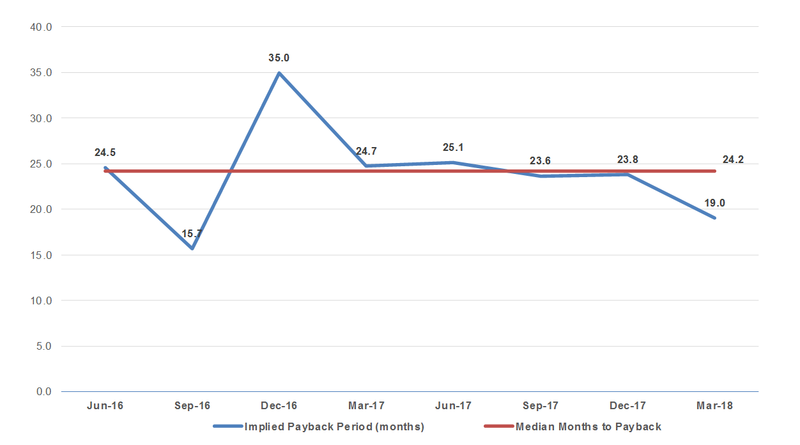 Tenable does not disclose customer metrics quarterly so I cannot derive CAC, but using a CAC ratio (implied net new ARR * gross margin / sales and marketing spend of prior quarter) we can find the months to pay back. Tenable’s median has been 24 months over the past 8 quarters. Medians for other SaaS companies are here. Tenable will most likely be valued on a multiple of forward revenue given their high growth and negative profit margins. The output below uses NTM (next-twelve-months) revenue as a proxy based on an illustrative range of growth rates. 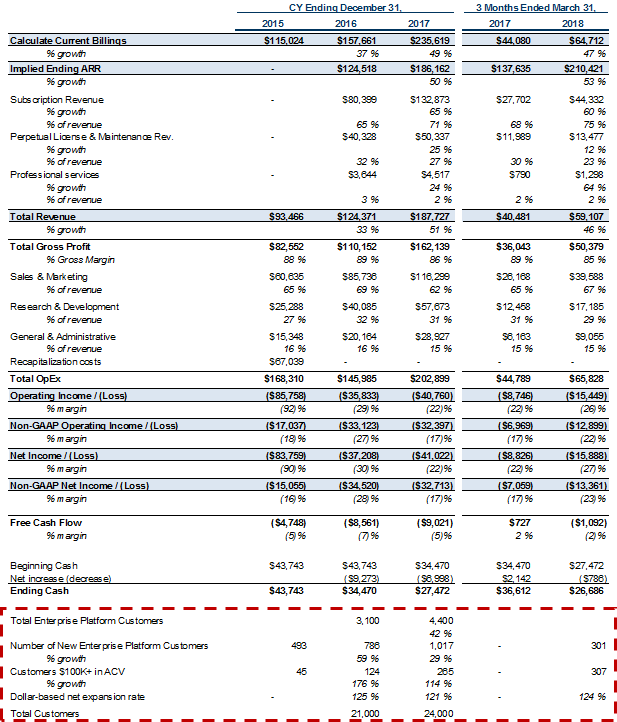 Below that is an ARR multiple range based on other high-growth public SaaS companies as a frame of reference. I also added the EV / NTM revenue multiples of Carbon Black and Zscaler (2 other U.S. cybersecurity IPOs this year) to the right (6-Jul-2018 close). They will most definitely trade significantly above their last pre-money valuation of $300M (Pitchbook) in late 2015. Tenable is a fast-growing business in a large and increasingly important market. Moreover, it’s extremely impressive and unusual that Tenable has financed its growth through revenue and never raised any primary institutional capital — all the proceeds from their financings were used to repurchase shares. The company has also created a strong community among security professionals given the long-standing success of Nessus, which has been around since 1998. I imagine the public markets will like the efficiency, growth, and increasing billings from enterprise customers. I think they have a great IPO — congrats to the Tenable team. To receive these posts by email, click here.